Straight-away and slightly downhill, mounds line both sides of the fairway and the green is guarded by a bunker on the left. This hole plays uphill and requires a drive in the fairway to avoid bunkers on the right and left. The green is guarded in the front and on the left by sand bunkers. This hole swings right with trees and a creek on the left and a large fairway bunker to the right. A huge sand trap protects the left side of the green. 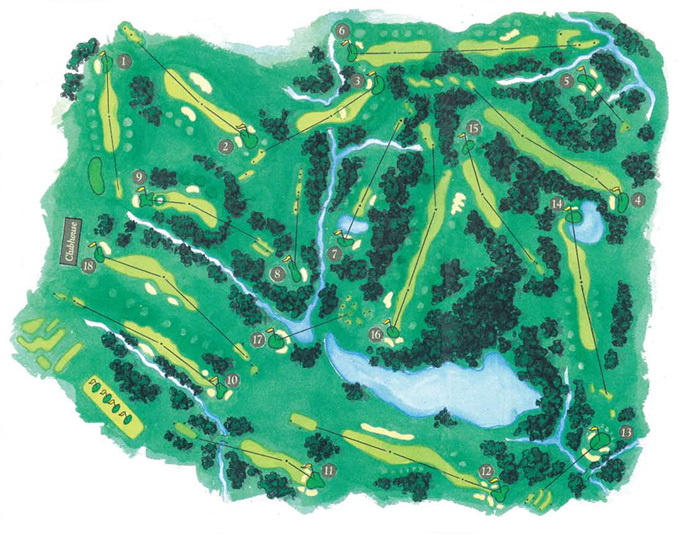 Choose one of five sets of tees covering over 100 yards to vary the length. The hole is tree lined on both sides. A true three shot hole, the premium is on the pitch to a well guarded pin. A beautiful par 3 cut through natural woods. A precise short iron is required to a sloping green guarded on all sides by sand bunkers. Hole #6 "The Road Hole"
Two well-played shots leave a short pitch into a boomerang shaped green protected by a large sand bunker in front. A good drive leaves a medium to short iron over water. The shallow three tiered green is the most challenging on the course. This hole sits naturally along a hillside. An accurate long iron into a narrow green is required. The green is elevated and flanked on the left by a huge sand bunker. A dogleg left through a rolling hill with trees lining the left side. A short iron to an elevated green must carry a bowl shaped sand bunker in front. One of the more difficult holes, this is a long downhill stretch with trees lining right and mounds lining the left. A good drive leaves a midiron to a generous green. A well placed drive through a narrow opening leaves a short iron to the largest green on the course. The green is elevated and protected by several sand bunkers. A good tee shot must avoid a long bunker down the left side to get home in two. Five bunkers surround the green. The three-tiered tee offers a range of club selection. The tee shot is hit from a hillside across a fifty foot ravine to a large green sloping back to front. A well-struck drive into a generous landing area leaves a mid to long iron into a large green protected by a lake in the front and right. The uphill dogleg right requires an accurate tee ball. A good drive leaves a short iron into a small green. A straight second shot will reward a short iron and a good birdie chance. A classic par three with eight elevated teeing areas overlooking the green. Water protects the front and right side of a sloping green. Power is the name of the game on this long uphill dogleg left home hole. Two bunkers guard the right of the green that slopes from back to front.